The need to better understand our Solar System is reflected in the fact that a key theme of ESA's Cosmic Vision 2015-2025 programme is: How does the Solar System work? Within this broad theme, one important aspect is space weather, a phenomenon driven by the constant interaction between the solar wind streaming from the Sun, and Earth's protective shield, the magnetosphere. Although our understanding of space weather has improved dramatically as a result of missions such as ESA's Cluster fleet and the ESA/NASA SOHO mission, we still do not understand the intricacies of space weather and therefore cannot accurately forecast solar storms – storms that may threaten our space-based technology and endanger human life. Although there are many spacecraft, such as Cluster, the Magnetospheric Multiscale mission (MMS), SOHO, PROBA-2, STEREO, and the Solar Dynamics Observatory, that constantly observe the Sun and its effect on the Earth's environment, no single mission is able to view the full Sun-Earth connection – instead they study localised processes and individual weather events. SMILE – Solar-wind Magnetosphere Ionosphere Link Explorer – fills this gap; it will study our magnetosphere on a global scale, building a more complete understanding of the Sun-Earth connection by measuring the solar wind and its dynamic interaction with the magnetosphere. gathering simultaneous images and videos of the dayside magnetopause (where Earth's magnetosphere meets the solar wind), the polar cusps (a region in each hemisphere where particles from the solar wind have direct access to Earth's ionosphere), and the auroral oval (the region around each geomagnetic pole where auroras most often occur). SMILE will also gather simultaneously in situmeasurements of the solar wind with the two other instruments making up its payload – an ion analyser (LIA) and a magnetometer (MAG). These instruments will monitor the ions in the solar wind and magnetosheath, and detect changes in the local magnetic field. 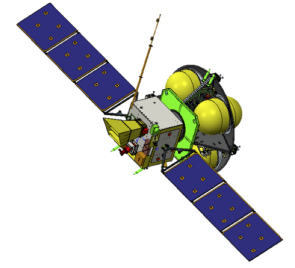 SMILE was selected from a pool of 13 potential missions that were proposed to the European Space Agency (ESA) and the Chinese Academy of Sciences (CAS) as a result of a joint call for mission concepts in 2015. The mission entered its two-year-long study phase at the beginning of 2016. This phase will be followed by four years of implementation: building, testing, and integrating the payload and the spacecraft. The payload and satellite will be provided by scientists and industry from Europe, Canada, and China. The mission will be implemented by ESA's Science Programme and the Chinese National Space Science Centre (NSSC) under CAS. After the joint ESA-China National Space Administration Double Star mission in the 1990s, SMILE marks the first time that ESA and China have jointly selected, designed, implemented, launched, and operated a space mission together.